"Springtime Moments- The Butterfly And The Lilac"
On this afternoon that I encountered this beautiful yellow and black butterfly with a touch of red flying around our lilac bush and sometimes settling briefly in different spots on our lovely light purple lilac bush, I did not know the type of butterfly but did so appreciate its beauty. 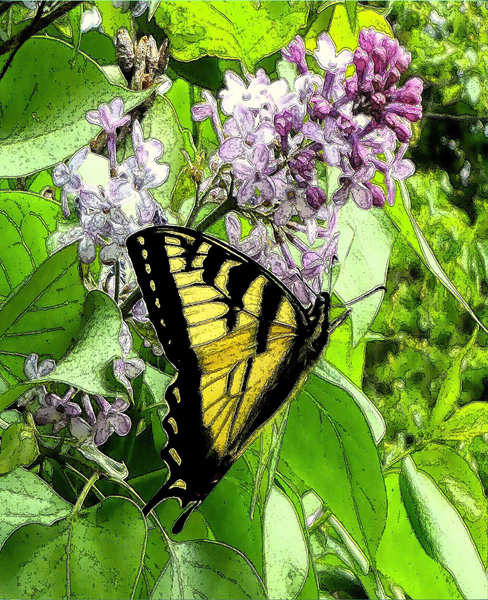 Spring was slow to come and the lilac was blooming late but it was still spring and I was so pleased to see the beautiful fragrant lilac bush, also, being enjoyed by this butterfly, the Eastern Tiger Swallowtail (Papilio glaucus) (a/k/a Tiger Swallowtail). This unique species of swallowtail is a quick and strong flier, gliding when able. The males are a bright yellow, while the females can exhibit two different color forms; yellow and black and black and blue. The darker form is more common in the southern states. The caterpillar is just as remarkable, it resembles a small snake with eyespots. This butterfly particularly enjoys pink, purple, and red flowers, and is a wonderful visitor to any garden. Average Wingspan: 3" - 6"
Lilacs are small trees, ranging in size from 6 feet 7 inches to 32 feet 10 inches tall, with stems up to 8 to 12 inches in diameter. Lilacs are bisexual, with fertile stamens and stigma in each flower. The usual flower color is a shade of purple (often a light purple or lilac), but white, pale yellow and pink, and even a dark burgundy color are also found. The flowers grow in large panicles, and in several species have a strong fragrance. Flowering varies between mid spring to early summer, depending on the species. The fruit is a dry, brown capsule, splitting in two at maturity to release the two winged seeds. Lilacs are often considered to symbolize love. Several locations in North America hold annual Lilac Festivals. Syringa vulgaris is the state flower of New Hampshire, because it "is symbolic of that hardy character of the men and women of the Granite State". Lilacs are popular shrubs in parks and gardens throughout the temperate zone, and several hybrids and numerous cultivars have been developed. Expressions of creativity come in many forms from artwork to writing. I love writing poetry and reading poetry since I was a child and collected poetry books and tried my hand at writing poetry. Here is my latest poem. Hope you will like it! "Springtime Moments: The Lilac And The Butterfly"
And my springtime moment is ever so unique. The lilac and the butterfly. "Honeybee Enjoying The Wild Purple Clover"
I took this photograph the other afternoon when my Paso Fino stallion, Contratercero and I were taking our daily walk. He is so cool. I can put the lead rope down and ask him to stay around and eat grass while I take photographs. I always bring my Nikon on these walks. I take many photographs but few are chosen. This one I thought was just so wonderful. I don't see as many honeybees these years as once. I have heard they are suffering and their numbers are declining. Honeybees are very important for pollination. I thought I would like to share some information on the value of clover. 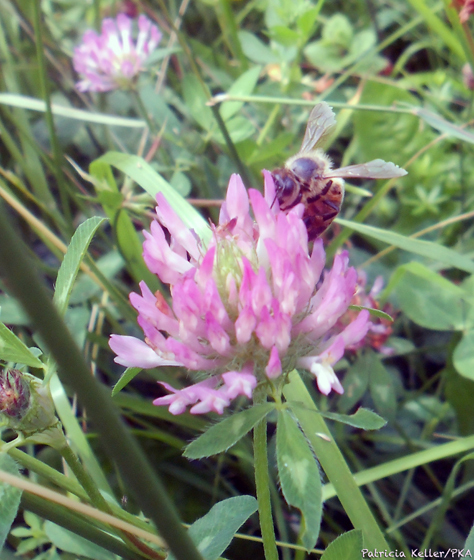 Clover is thought of as a weed but to the Honeybee it is a source of food. Did you know that people can enjoy clover, too? All parts of the plant are edible: roots, stems, leaves and flowers. Clover can be eaten raw, but cooking it can make it more digestible. The leaves can be steamed or boiled with no bitterness as can be found with dandelions. Clover is kind of bland and so can be seasoned with garlic or onion. The raw leaves and blossoms create a colorful addition to one's salad. It is high in vitamin C and iron and nearly as healthful as spinach but less flavorful. Tea can be made with a handful of clover leaves in boiling water. The tea can be helpful as a cold remedy because it acts as an expectorant and offers a high amount of vitamin C. The tea, it has been said, can be effective treatment for liver and blood ailments.